This year the Thursday meeting of July Edition of Brimfield featured the Mays field opening at the civil hour of 9 AM. This is a field where dealers must not unload their trucks until the gates open to the public, so it is one of the two fields (Hertans is the other) where dealer “picking” before the opening bell is minimized. Today the weather was cloudy and rain threatened, finally producing some light rain as I left the field about 11am. 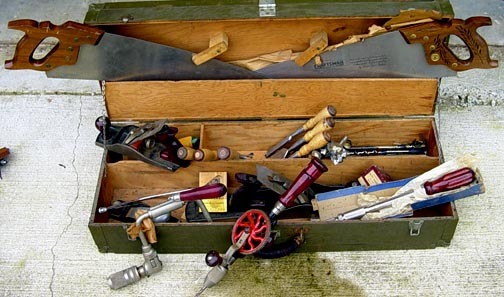 Mays is seldom very good for me, as tools are often scarce, and there are few dealers who routinely bring good tools. That was true today, especially since the dealer population was a little better than half of that found in May. After walking the field quickly I came up with little in the way of tools—a small G-P drill, and Lindsey center bead from a gun dealer, and a set of manufactured trammels. 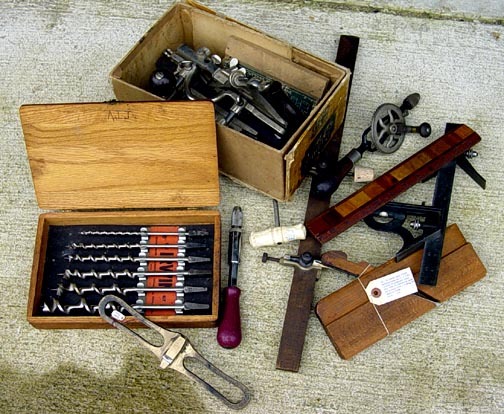 A second, slower perambulation produced just a few more tools—boxed half set of Irwin bits, brass rabbeting shave, Starrett combo rule with center and try square heads, Yankee 35 ratchet screw driver, and a curious 12 inch rule with examples of 12 different woods. The final buy was from a general antiques dealer who had a quite decent No. 45 combination plane, complete, shiny, and in a ratty original box. Usually such dealers want unrealistic prices for these things, but this guy quoted a very reasonable price, and then came down 20% to my offer. With these tools in the truck I made another slow round, spending more time chatting with dealers and looking at art and ivory stuff than looking for tools. I did spy a pair of Alexander Pope, Jr chromolithographs of ruffed and spruce grouse that were interesting, but even the reduced price was a bit high. Maybe tomorrow. Another dealer was hawking some interesting old lithographs, including a somewhat damaged copy of Currier & Ives’ “South Sea Whale Fishery.” I own an example of the third state (done about 1834) of the original version of this scene that was painted by the English artist H. J. Huggins about 20 years before the Currier & Ives copy. It was interesting to see the differences. Currier & Ives included only 3 of the 8 whaleboats visible in the original, and manned one of them with 8 seaman—American whaleboats invariably had only 6 men aboard. Moreover, the copy was produced with mirrored images, so it is reversed and makes the whale ship in the scene bringing blubber over the port, rather than the starboard side—another gross inaccuracy. It presents a quite distorted view of 19th century whaling, and certainly wasn’t the “masterpiece” this dealer presented it as—nor worth anywhere near the price he was asking. Finally, as the rain began to patter down, and dealers were buttoning up their kiosks, I headed back to the truck, and at the last row of dealers spied a guy who had an open chest of tools. This turned out to be an army chest that apparently was given by his army unit to a carpenter as a gift when he mustered out of the service at the end of WWII. The guy quite obviously never used the tools. And while most of them were marked with “Craftsman” mark, they were obviously quality ones, made by Disston, Millers Falls, Sargent, etc. I looked them over closely. Most had their original wrappings and were pristine. It was like a mid-1940s time capsule. So, after talking with the dealer a bit, he came down dramatically on his asking price (after all, it was raining), and I lugged a very heavy chest of tools to the car. It was a decent end to a rather slow day. Tomorrow the J&J field opens at 8am. I expect to be there.